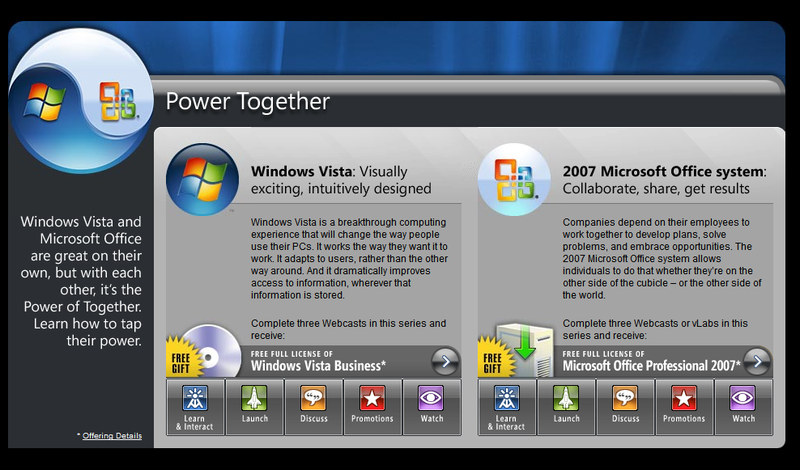 Microsoft have put up a few images of the EVO (Exchange 2007, Vista and Office) released-to-manufacturing screenshots on their “A New Day for Business” bit on the PressPass website. Kinda fits seeing as all three have RTM’d and are available for businesses. Anyway, enjoy! Note: Some of the images are rather big in size – they vary from around 600kb to around 1.4mbso just be careful! Those who have recently bought boxed versions of Windows and/or Office programs can now request an upgrade to Vista and/or Office 2007 for a nominal fee. Elegibility requirements (product bought, date of purchase, etc) and the nominal fee change from region to region, you’ll need to check the details for your country. Thank you for being a valued Microsoft customer! As a show of our appreciation to customers who acquire a qualifying Windows XP or Microsoft Office 2003 boxed product from a retailer or authorized Microsoft reseller during the qualifying eligibility period, we are providing minimal cost upgrades to Windows Vista and 2007 Microsoft Office software. Read from MCT Private newsgroup, knowing that there is a chance for you to get a free copy of Microsoft Vista Business and Microsoft Office Professsional 2007 with FULL license. YES, Free and FULL license. So if you miss out the chance to be beta tester of Microsoft Connect and submitted bug(s) to get your free copy, here is another chance for you. All you have to do is complete three webcastsÂ of Vista or/and Office from the website within 30 days of registration, then you will get one or both if you complete them both. 1) You are legal residents of US and 18 years ago or older. 2) You are not participate in the Microsoft Partner Program or the MSDN. These offers expire on 28th Feb, 2007, or while supplies last, so don’t wait and visit there for your OWN, FREE and FULL copy of Microsoft Vista Business and Microsoft Office Professional 2007. Office 2007 is on MSDN! Right now only Office 2007 Professional and individual applications are on Connect. We’ll see if they add other suites (Professional Plus and Ultimate). Office 2007 keys available on MSDN Subscriber Downloads! Yep, the Office Professional 2007, Office Professional Plus 2007 and Office Ultimate 2007 product keys can now be requested on the “Product Keys” section of your MSDN Subscriber Downloads. I do hope this is a sign that good things are coming! Dates of releasing Office 2007 and Vista on MSDN! From my older post, http://www.msblog.org/2006/10/31/windows-vista-and-office-2007-availability-on-msdn-subscriber-downloads/Â , Office 2007 and Windows Vista will be released on MSDN 7 days after its RTM. Windows Vista will be released on MSDN on 17th Nov 06.
http://licensing.microsoft.com, http://partners.microsoft.com and MSDN’s Download site will be having downtime from Friday to Sunday Nov 12th 4PM; till Saturday Nov 11th 10AM; from 7PM till 9PM Friday Nov 10th respectively. Guess they are getting the required servers and bandwidth ready for ROCK-AND-ROLL! Microsoft will make available Office 2007 – its suite of business programs. From 30 November corporate customers of the software giant will be able to get their hands on the next version of the operating system. Also on that date Microsoft will make available Office 2007 – its suite of business programs. Home users will have to wait until January 2007 to get hold of a copy of the Vista software. Vista is the long-awaited update of the Windows operating system that was originally slated to be released in August 2006. The software has been under development for more than five years. The release will be a simultaneous global launch. The software is a major overhaul of Windows and updates many of the core technologies. New elements include improved security, an improved 3D interface, plus new sound and networking technologies. Vista, known as Longhorn during its gestation, will be available in six separate versions to match the differing needs of computer users. Three of these are tuned for businesses, two are for home users and one will be for developing nations. Microsoft has yet to give details of the prices of the different versions but it has released information about what PCs will have to do to run the software. Many PC makers are now selling “Vista-ready” computers. In the US the software will be unveiled by Microsoft boss Steve Ballmer at an event at the New York Stock Exchange. New Microsoft Office Online Website Launched! Thanks to Leen Snoek for this. Microsoft Office Online website has just launched! It sports a whole new interface. Click here for the link to Microsoft Office Online! Posted in MS News, Office 2007 | Comments Off on New Microsoft Office Online Website Launched!